Does anyone else de-stress while crafting & drinking wine? My sister brought some wine from New York and the Grand Valley, Colorado; they were the perfect pairing with crafting -- cheese and strawberries optional. It helped make rolling paper beads fun. If you've ever made paper beads you'll know that its time consuming, great to do while watching a movie, a long movie. Or catching up on your DVR'd shows. Or having a long conversation with someone. This project inspired by cereal box hearts at SweetpepperRose. Click Here. The kids found the chicken wire by the side of the road and it was the perfect fit for this thrift-ed frame. Score! The backing was a scrap of linen leftover from a remnant bin. The kids shirts say, "I Love Daddy." I totally love how this turned out and want to make more. Thinking of doing mini stars next time. Or a necklace. Or both. 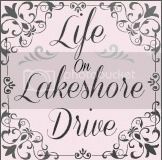 Featured at 21-valentines-day-wreaths-and-home @ Lake Shore Drive. Great idea for a paper beads! I too enjoy a glass of wine while in the art room creating. Seems to get the juices flowing! Your beads turned out faboulous! I have quite a few soda boxes I could use for this, I'll have to think twice before throwing them out now! Thanks for linking up to the Curb Alert! 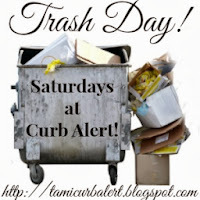 Trash Day Link Party! Have a great weekend!